The Galaxy 15 satellite is seen before its 2005 launch to geostationary orbit nearly 36,000 kilometers over the Earth's equator. PARIS ? An attempt to shutdown the electronics payload of the out-of-control communications satellite Galaxy15 has failed, leaving the satellite - which ceased responding to ground commands last month - still in itsuncontrolled "zombiesat" drift toward orbits occupied by other spacecraft, the satellite's fleet operatorIntelsat said Tuesday. Galaxy15 is closing in on the geostationary orbital slot occupied by anotherC-band satellite, the AMC-11 spacecraft operated by SES World Skies, and withits stuck-on communications payload will be in a position to cause potentially severeinterference with the SES satellite during a two-week period starting aroundMay 23, according to Intelsat and SES estimates. The unsuccessful attempt toshut down the so-called "zombiesat" ? a satellite industry term forfailed satellites in orbit - occurred on Monday. In a Tuesday statement inresponse to SpaceNews inquiries, Intelsat said itis researching other ways to shut down Galaxy 15 once the satellite has passedthrough the AMC-11 position and enters ? for a limited period of time ? astretch of orbital terrain unoccupied by other C-band spacecraft. ?We do not have an additionalspecific technical attempt identified at this time,? Intelsat said in thestatement. ?But we will not give up, and expect to have other options to pursueat that time. We are now cooperating with other operators and customers tominimize potential service disruptions caused by interference.? Galaxy 15 stopped responding toground commands April 5 and since then has drifted out of its 133 degrees westlongitude orbital slot on an eastward path along the geostationary arc ataround 36,000 kilometers above the equator. 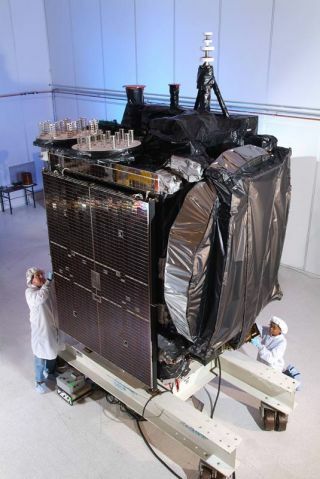 After sending between 150,000 and200,000 commands to the satellite to coax it back into service, Intelsat wasforced to scrap its satellite-recoveryefforts and to resort, on Monday, to a limited-duration effort to force thesatellite to shut down its transponders. This was to be accomplished by sendinga stronger series of signals designed to cause Galaxy 15?s power system tomalfunction and force a shutdown of the satellite?s payload. That attempt, whichLuxembourg-based, Washington-headquartered Intelsat had viewed as its last,best-understood option for Galaxy 15, was unsuccessful. With the satellite nownearing AMC-11, Intelsat is limited in what it can do besides assure itself ofthe satellite?s location. ?There is no active testing of the payload,? thecompany said in its Tuesday statement. Sending radio signals strongenough to forcea satellite to shut down could pose dangers to other spacecraft in thetarget area, which is why Intelsat had only a short window of time to ?pulse?Galaxy 15 with signals intended to trigger a failure of its power system. Thatperiod lasted about 30 minutes on Monday. ?Intelsat fully coordinated withneighboring operators the timing and the effects of this testing to neighboringspacecraft. It is our current understanding that no SES AMC-11 customers wereaffected by the disabling attempt,? Intelsat said. Intelsat and Luxembourg-based SEShave been closely coordinating interference-avoidance options since the initialGalaxy 15 failure, knowing that at predicted drift speeds the satellite willenter AMC-11?s 131 degrees west slot to within 0.5 degrees of AMC-11 on orabout May 23. SES officials say they are devisingan elaborate series of maneuvers to create a maximum distance between Galaxy 15and AMC-11 during the period ofmaximum threat. While they cannot guarantee that there will be nointerference to media customers using AMC-11, the SES officials believe theyhave the resources, including teleport facilities to reroute traffic, requiredto minimize the problem during this two-week period. Continuing its eastward drift,Galaxy 15 will exit the AMC-11 orbital slot starting around June 7, when it isexpected to have moved to 0.5 degrees to the east of the satellite. At that point, a new opportunitywill be open to Intelsat as there is no C-band satellite at the next orbitalstation of 129 degrees west. What Intelsat might do toprecipitate a shutdown remains unclear. Industry officials say the Galaxy 15problem ? a satellite operating at full payload power that is no longer undercontrol ? is unprecedented. Intelsat has said it is seeking advice fromsatellite operators and manufacturers ? not just the Galaxy 15 builder, OrbitalSciences of Dulles, Va., but also other companies with more experience within-orbit problems ? on possible options to force a shutdown. Current estimates are that Galaxy15 will lose Earth orientation sometime in late July or early August. The exactdate cannot be known. But when it loses Earth pointing, its solar arrays willlose their lock on the sun, draining the satellite?s batteries and causing thesatellite to shut down on its own. Once the satellite leaves thevicinity of the AMC-11 and passes through the relatively safe neighborhood of129 degrees west, it will enter a new neighborhood where it poses aninterference threat similar to what AMC-11 now faces. But this time, it is onlyIntelsat-owned satellites and their customers at risk. Galaxy 15 will be moving throughthe operating areas of Intelsat?s Galaxy 13 in mid-July, and is expected toarrive at the Galaxy 14 neighborhood in late July. By mid-August, it will be atthe orbital slot of Intelsat?s Galaxy 18. How Much Junk is in Space?